ASML said last week that it planned to ship 30 extreme ultraviolet scanners in 2019, up significantly from 2018. 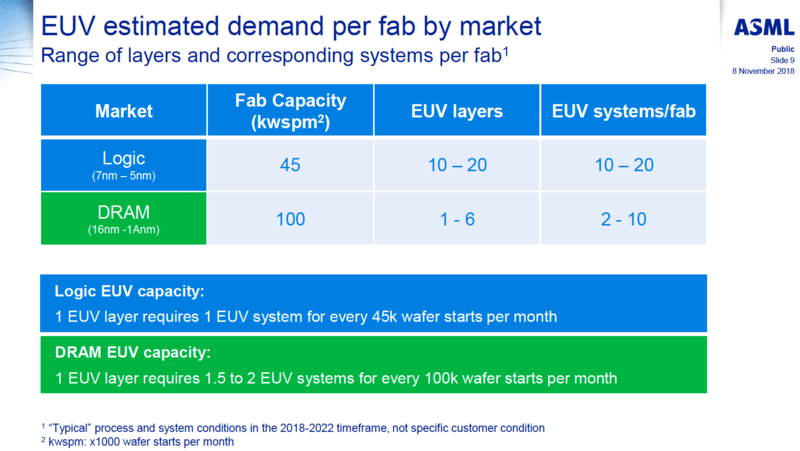 The plan is not surprising, as demand for EUV lithography tools is rising and semiconductors manufacturers are building new fabs. In addition, ASML indicated plans to introduce a new EUV scanner that will offer a higher production throughput, the NXE: 3400C. Last year ASML shipped (only) 18 Twinscan NXE: 3400B EUV scanners. This was slightly below its expectations, to supply 20 machines. In total, as of July 2018, there were 31 EUV scanners installed at various fabs across the world, including several machines in various semiconductor research organizations, including imec. If everything goes as planned, ASML will ship more extreme ultraviolet scanners in 2019 than it did in in years before that. Samsung Foundry has already started to use ASML’s EUV equipment for production of commercial chips using its 7LPP process technology at its Fab S3. As reported, a major increase of EUV lithography use by Samsung will commence after it builds another production line in Hwaseong, which was architected for the EUV tools from the start. The fab is set to cost 6 trillion Korean Won ($4.615 billion), it is expected to be completed later this year, and start high volume manufacturing in 2020. TSMC is set to start using its Twinscan NXE scanners for commercial wafers in the second half of this year to produce chips using its N7+ manufacturing technology. Initially EUV scanners will be used for non-critical layers, but their use will be expanded at the 5 nm node in 2020 – 2021. TSMC says that virtually all customers that use its N7 fabrication process will also use its N5 technology for their next-gen chips. Demand for ASML’s Twinscan NXE tools will be further boosted by demand from Intel and SK Hynix. Intel will need EUV tools as it expands its fabs in Oregon, Israel, and Ireland. Besides, the chipmaker will need EUV scanners to equip its Fab 42 in Arizona. These factories will be used to produce chips using Intel’s 7 nm fabrication process. SK Hynix will need EUV tools for its new fab near Icheon, South Korea. According to ASML, one EUV layer requires one EUV step-and-scan system for every ~45,000 wafer starts per month. As leading makers of semiconductors expand the use of EUV tools going forward, they will need additional scanners, which will naturally increase demand for ASML’s Twinscan NXE products. Later this year ASML will introduce its new generation Twinscan NXE: 3400C EUV scanner that will be able to process 170 wafers per hour, up from 155 wafers per hour on the NXE: 3400B. The new scanner will use Cymer’s new 340 W light source, which will enable higher performance. ASML’s Twinscan NXE: 3400C will allow chip manufacturers to keep cycle times for their next-gen chips in check. I'm sure it's way more complicated than I could possibly imagine, but when I see these things I always wonder: If you have the knowledge, capability, and capitalization to make something like this, why bother selling it to Intel or GloFo or TSMC? >y imagine, but when I see these things I always wonder: If you have the knowledge, capability, and capitalization to make something like this, why bother selling it to Intel or GloFo or TSMC?